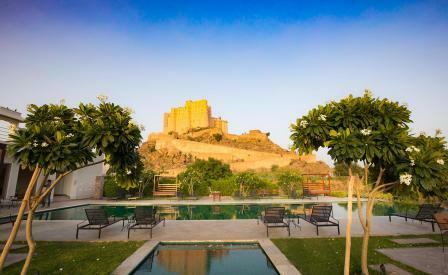 After nearly a decade in the making, the Alila group’s second property in India has finally opened in Rajasthan’s Aravalli range. Set atop a granite hillock in a region speckled with havelis, villages and temples and with surrounding 360-degree views of the rolling landscape, the 59-suite hotel is far from the madding crowd, but near enough for excursive strikes to Jaipur’s famed landmarks. Architects and interior designers Sandeep and Ritu Khandelwal have painstakingly revived, renovated and reconstructed the 230-year old defensive fort with grace, preserving original architectural details such as the intricately arched windows and ornamental latticed jaalis. In contrast, the internal spaces have been reshaped into clean-lined simple rooms, flecked with local elements from hand painted block fabric to old-style doors and wall frescoes with Thikri mirror work. For the more adventurous guests, biking, horse-riding, trekking and All-Terrain Vehicles are on offer, but personally, we’re staying put to take in the evocative views from Nazaara, the open-air terrace lounge, where meats are cooked in sandpits and on barbecues and served from the outdoor kitchen.